At Quipu and previously as the IT Department in IPC, we have been providing IT solutions and doing projects since 1990. In the past 10 years we have developed from scratch a complete suite of modern banking applications that cover all the operational needs of a typical bank from Core Banking System to Accounting, Treasury, MIS and Reporting, Customer Relationship Management, Operational Risk Management, HR Management, eBanking and mobile banking. We have in parallel implemented this suite in most of the banks part of the ProCredit group. In a typical year we run in parallel more than 50 projects that span over 3 months in duration each and a significant number of smaller projects. Project Management is one of our core competencies and one of our fundamental pillars of operations along with Development and Support. Organization is one of the key components for project success. Projects run by Quipu have well defined, hierarchic organization structure with defined roles which ensure seamless execution and transparent responsibilities. At the core of how we organize projects are our Quipu Project Managers. They are professionals with extensive background in software development responsible for the fulfillment of the project goals, the financial control and the management of the Quipu resources involved in the project. Quipu Project Managers are also the operational leaders actively participating in the resolution of issues and management of the changes. Another essential role in the successful organization are the Customer Project Managers which mirror the responsibilities related to the fulfillment of project goals and actively manage the customer resources involved in the project. They must be full time available and empowered to make decisions. Both Project Managers respond directly to the Project Control Board. The Project Control Board is a permanent body that provides guidance and oversight of progress. It reviews and decides upon major changes and resolves issues that are out of the normal decision range of project managers. Members do not usually work on the project themselves. They are the representatives of the customers such as business line managers or executive managers, project sponsors responsible for the business cases. They are joined by Quipu representatives such as project coordinators, regional managers or management board members. The Project Managers from both sides will attend meetings of the Control Board to report on progress and answer any questions raised by members. Decisions and discussions are recorded in the minutes of the meeting. For large scale complex projects such as software implementation Control Boards are typically scheduled around the major milestones. Smaller scale projects can be bundled together and a whole portfolio of such projects can be reviewed within one single meeting. 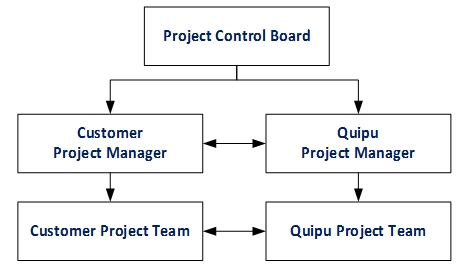 Quipu’s project management methodology breaks up the project into successive phases. Typically, during this phase an idea for a project will be examined by the customer organization to determine whether or not it may bring certain benefits. During this phase Quipu can be consulted regarding the plausibility of certain technical implementations. If the project is successfully initiated a request is raised towards Quipu with a mandate to appoint a Project Manager that will take responsibility for the completion of the rest of the phases. During this phase the project scope and boundaries are clarified and the deliverables are identified. The total amount of work required to complete the project is broken down into activities which are prioritized to form the project schedule or plan. Resources are then allocated to complete each activity and the project budget is calculated. A financial offer is then presented for the approval of the customer before moving forward with the next phase of the project. For large scale complex projects Quipu will conduct Gap Analysis to allow for a deeper understanding of the project requirements before engaging into planning activities. This will be subject to a separate financial offer which the customer has to approve before moving ahead with the analysis. All this information is recorded in a narrative form the Project Charter while the project plan is depicted in a Gantt Chart format. Together these two documents form the baseline of the project against which all future benchmarks are made. The end of each iteration represents a project milestone when a concrete deliverable is achieved. An acceptance form is signed by the customer at each milestone certifying the achievement. The main purpose of this phase is to keep the project together and ensure that everything goes according to the plan. Project Managers will compare project status to the actual plan and evaluate the progress made, as resources perform the scheduled work and record the individual progress achieved on each task. This enables adjustments to be made to the schedule and changes to be introduced into the project in a controlled way allowing for their impact to be assessed and factored in the plan. The procedures for managing changes are described in full detail in a subsequent chapter. Project managers will inform the customer about the progress every second week by providing the tracking Gantt Chart. In case of variations reasons will be provided and remedial actions will be suggested. Once the project tasks are completed and the customer has approved the outcome, a review is carried out to highlight project success and/or the lessons learned from the project history. The project is also compared against the originally approved baseline in order to understand the magnitude of the changes incurred. During this process differences from the costs initially estimated during the planning phase will also be reconciled between Quipu and the customer. Quipu supports its customers through the process of Change Request Management in a comprehensive manner. In our approach we appreciate that requirements may change at any point of time in the development/ implementation/ support cycle. These may be enhancements to, or changes in, the existing functionality. The goal of this process is to incorporate the change successfully without impacting the whole project or the business conditions of the client in an adverse manner. The definitions for the categories that fall within a typical Request for Change can be found in the Definitions section at the end of this document. We take Bug Fix Requests very seriously and direct immediate attention to finding workarounds and permanent fixes. To enable us to achieve the timely reaction in isolating and remediating a “bug” we require that any Bug Fix Request must be accompanied by the detailed account of the circumstances in which it manifests itself, otherwise known as reproducibility steps and criteria. Some of the “bugs” are dealt by in practice by the adoption of workarounds at the operational level. These workarounds may actually deliver the desired outcome of the process and allow the customer to continue operations for extended periods of time without remedying the “bug”. This sub-category of “bugs” for which known workarounds are available and for which the effort of fixing them within the application may outweigh any benefit will be listed on a “know bugs list” along with their operational workarounds. Within a project any Request for Change can be registered and followed through to their resolution through our online platform Gemini. Changes that impact the scope, cost, quality or schedule of the project will be analyzed and will result in a formal technical and financial proposal for implementation that will underline the impact of the Change on any of the components mentioned above as well as any alternative solutions. The proposal will be documented using the Technical and Financial Proposal template annexed to this agreement. The customer’s approval will be recorded through the signing of the proposal and of the new project plan updated to reflect the details of the change. Quality management is a key component of any Quipu project and it is the responsibility of all participants and stakeholders to support and promote the quality of the project and its deliverables. Quality management is concerned with all activities and deliverables of a project, including project planning, design, documentation, specifications, production, training, risk assessment, and implementation planning, that combine to meet the expectations of stakeholders. Reviews and tests are conducted at quality control checkpoints throughout the project and are tied to the deliverables of one or more of the project tasks. Corrective actions are implemented to address any defects or non-conformities with the quality requirements defined in the project specifications. Quipu Gemini, the platform available to all our customers, is the single point of contact for managing all documentation, issues, tasks and activities associated with a project and following them throughout the lifecycle towards resolution, irrespective of their nature. Issues may originate through other channels such as phone calls, video conferences, Skype or other instant messaging conversations, face-to-face meetings or e-mails but in order to be processed they have to be registered on the Gemini platform. Gemini is the primary means of coordination between Quipu and the customers for recording project related issues, tasks and activities and tracking their progress towards resolution.